Christmas Text messages make to your lovers makes them feel they're still loved. When one is loved and the loved one has for each other is been practicalised, it Keeps the heart of the loved and the lover together. 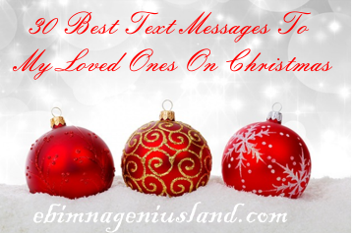 Christmas text messages are mostly to remind the people we love that we are happy to see them at the end of the month, and also that we still care about them on the next Christmases to come. Christmas is mostly a season of joy, happiness, laughter, and enjoyment as well. When Christmas seasons Love Actually blows around the corner, everyone wants to be loved more than ever. The breeze of Christmas makes everyone happy and changes a lot of things in people's life. 30 Best SMS/text messages to my loved ones on Christmas period. 1. Christmas is around the corner, I will never stop loving you because you have always been my best even before Christmas. Happy Christmas in advance. 2. Christmas period changes the crises period in our lives to period of joy, which I always want to see you be part of it. I will always love you, happy Christmas my love. 3. All I desire is nothing more in life but to spend the rest of the Christmas yet to come in my whole life with you. I am happy to have u be part o* The desire for Christmas to come has been my dream every night and day. Thank God Christmas is already on the way. Happy Christmas my beloved. 4. Christmas love makes me feel better than I've ever felt, thank you for making me feel more better than I've ever felt. Merry Christmas sweetheart. 5. I don't want to see you cry anymore, I always want to see you smiling, I'm happy you love Christmas. Merry Christmas to you honey. 6. Whenever I close my eyes, I see the breeze of Christmas blowing around me, it has never left, until the day I met you on the Christmas day. I stopped dreaming of the Christmas breeze and I start dreaming of the Christmas Girl. Happy Christmas my dream achiever. 7. Dreams come true when you make them happen, I will always remember you for making my dreams come true on Christmas day. Merry Christmas to you dear. 8. I am not sending you a Christmas gift because I'm rich, I'm doing it because you made my Christmas one of the best gifted day in my life. 9. When Christmas comes you make me your best friend, even after Christmas I still remain your best friend, I have never felt that way in my life. Therefore I wanna say Thank you for being there for me even after Christmas. I love you. Merry Christmas my everything. 10. I can never stop thinking of you, I will keep blessing my ancestors for making Christmas day the day of everlasting joy in my life by connecting me to the most handsome and caring Guy like you. Thanks for coming on the Christmas day. Merry Christmas. 11. Christmas day is the day of celebration of a baby, our Lord Jesus Christ, of a truth you are the next baby after Jesus who has come to the world to save me from heartbreaks. Merry Christmas my love. 12. Among all the Christmas I've ever enjoyed, this Christmas is the best because you made it the best for me. Thank you so much my bestie. Merry X-mas. 13. I'm 25 today, for the past 25years in Every Christmas, I always cry because there's no one to wish me happy Christmas but as soon I met you, you have never failed to wish me Merry Christmas, Thank you for bringing to my best world I've always been crying for. 14. I love Christmas period the moment I noticed that you don't play with Christmas, you have made Christmas a moment of remembrance in my life. Happy Christmas my sweety. 17. I wish you a blessed holiday season. May this Christmas bring you comfort, joy, peace, and happiness to last throughout the coming year! 18. Christmas is a time for cherishing those who bring so many blessings to our lives. May your heart feel that love this Christmas and throughout the New Year ahead. 19. It is easy to get lost in the flurry of activity during the holiday season. May you get time to take in the beauty and true meaning of the season and have a Merry Christmas! 20. Christmas is the best season for laughter, may laughter feel your mouth forever, you will never experience tears anymore in your life. Merry Christmas my beloved one. 21. I celebrate the first day I met you, you really made my day feel like it was a Christmas day, I wish that this Christmas will be as sweet as the first day I met you. 21. So thankful am I for having a friend like you. Wishing you blessings for the holidays and the coming year.Merry Christmas and happy new year in advance. 22. Being alive is my choice, but immediately I met you, being alive on Christmas days became my direction of choice of life. merry Christmas to the one that saved my life. 23. I sincerely hope that this Christmas becomes a great end, to an even better year. Merry Christmas my dear friend! 24. The holiday season is the best time of year. One of the things that makes it so great is that I get to spend it with you. Merry Christmas my dearest. 25. My love, you are the reason I believe that dreams come true. I love you more than you can possibly imagine, and may this holiday bless you with all the happiness in the world. Merry Christmas. 26. I never liked Christmas period because it has always been a moment when I see some people die uncommonly like fowls, but since the time you came to my life on the Christmas day, You changed my thoughts to a thought where I believe that Christmas is not the way I think it is. 27. Whenever I hear of Christmas I put on a smiling face and the reason is that you will make my Christmas romantic. Merry x-mass in advance my true lover. 28. The true heart of Christmas is one of the wonders and warmth one. May any holiday stress you feel fade away and be replaced with this. Merry Christmas! 29. I wish Santa brings you the gift of never-ending happiness this Christmas! May you and your family be blessed abundantly. Merry Christmas and a Prosperous New Year in Advance! 30. I love you more than I love Christmas, but I love Christmas for the sake of Christ. Happy Christmas in advance my beloved.